In the heart of Lee Vining is Mono Lake, an ancient, salty sea filled with history, beauty and mystery. Mono Lake is 30 miles north of Mammoth. The salt waters of this ancient inland sea sustain a unique biosphere where tiny brine shrimp feed millions of migrating birds each year. Strange tufa formations, unusual shorelines and two volcanic islands are as interesting to visitors as the 50,000 California gulls and dozen or so bird species. Guided walks, kayak rides, a museum and a visitor center are stimulating and informative. The lake is located off U.S. 395, 30 miles north of Mammoth Lakes. Meander among the odd-shaped tufa towers. These unusual towers are piled-up mineral deposits formed beneath the water's surface when mineral-rich spring water mixes with salt lake water. Consider arranging for a guided canoe tour of the lake. Visiting Mono Lake generates enthusiasm and wonder. The striking contrast between the open skies, snowy peaks, and mirror lake are inspiring. Don't forget to visit the exhibits every summer day. 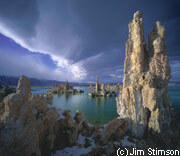 The rangers conduct guided walks during the summer and Mono Lake is an inspiring place to visit. What you'll see when you get here: Seagulls fly inland to feed on the millions of brine shrimp that Flourish in Mono Lake. More than a 100 birds can be seen here from time to time including Brewers blackbirds, Kildeer, Phalaropes and Violet-Green Swallows. The Tufa at Mono Lake is the showpiece of your visit to Mono Lake. The local springs contain calcium and when mixed with the high concentration of carbonate the tufa is created. There is a wonderful exhibit at the Visitors Center that gives children the opportunity to make their own Tufa! The Native Paiute Indians of the region included into their diet the abundant Alkali flies that live along the shoreline. Don't worry, they prefer not to land on you or even touch you. Kids love trying to step on the flies and are amazed as the blackened lakeshore suddenly opens. Flies scamper to allow clear passage. Mono Basin is full of natural things to see. Besides the magnificent Tufa, there are the Mono Basin Volcanoes, and the Panum Crater. The Mono Basin map will show you how to get around. A great place to start this tour is at the Visitor Center. Hiking, swimming, boating, and cross-country skiing are just a few of the many activities you can enjoy at this unusual lake. Photographers come from all over the world to capture the interplay of light, desert, and water. The natural history of the lake is described and explained in a one-mile self-guided nature trail at South Tufa. This spectacular tufa area is the best place to visit if you have time for only one stop. A boardwalk trail below the Mono Lake County Park allows access to the north shore tufa area and marsh. A trail at Panum Crater leads to the dome and crater rim. A swim in Mono Lake is a memorable experience. The lake's salty water is denser than ocean water, and provides a delightfully buoyant swim. Old timers claim that a soak in the lake will cure almost anything. Keep the water out of your eyes or any cuts, as it will sting. These programs are a cooperative effort of the State Reserve, U.S. Forest Service and the Mono Lake Committee. Rangers lead tufa walks throughout the year at the South Tufa area. The regular schedule is 1 pm on Saturday and Sunday from October 1st through mid-June. Tours are offered 3 times daily from July 1 through Labor Day (10am, 1pm, and 6pm), and daily at 1pm in September. Tours of Panum Crater are offered in the summer, as well as Star Shows on the south shore of the lake. Cross-country ski tours are offered in winter when snow conditions permit. A spooky Halloween Moonlight Walk is offered each October. You can also rent boats in Mammoth for your own tour. The Mono Basin Scenic Area Visitor Center is a great place to start your visit to this area. The center is located just off Highway 395, north of Lee Vining and includes a variety of exhibits about the natural and human history of the Mono Basin. Visitor center staff stands ready to help you plan your explorations of Mono Lake and the Eastern Sierra.